What Did You Think of the 3-Hour edition of iMPACT? The biggest name in professional wrestling history, Hulk Hogan, will make his first LIVE appearance on Total Nonstop Action Wrestling's "TNA iMPACT!" in a LIVE 3-Hour special on Monday 4th January at 8/7c on Spike TV. Hogan and TNA President Dixie Carter attended "The Ultimate Fighter Heavyweights" Finale in Las Vegas where Hogan made the announcement in an interview with Joe Rogan. "TNA iMPACT!" will be going against "WWE Monday Night RAW" on the USA Network, the first time two wrestling companies have broadcast LIVE head-to-head since the "Monday Night Wars" in the late 1990's between WWE and WCW. This "iMPACT!" special will broadcast LIVE from the TNA iMPACT! Zone at Universal Studios in Orlando, Florida. Hogan's first appearance inside the six-sided ring of TNA Wrestling will follow weeks of speculation after Hogan and Carter announced their partnership on Tuesday 27th October at Madison Square Garden in New York City. Hogan has hinted in various media interviews that he'll have multiple surprises in store for TNA Wrestling fans. "I knew when I signed with TNA, that it would be important to make a statement with the first episode. Going head-to-head on January 4th, makes the statement loud and clear: Game on!" Hogan said. 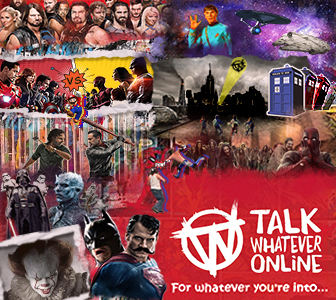 "TNA is kicking off 2010 in the biggest way possible with the biggest name in the history of our sport. Hulk Hogan is a pop culture icon, and his arrival will change not only TNA, but the entire professional wrestling landscape. We’re firing that first shot," Carter said. Joining Hogan for the three-hour LIVE "iMPACT!" will be TNA World Heavyweight Champion "The Phenomenal" AJ Styles, Olympic Gold Medalist Kurt Angle, Mick Foley, Kevin Nash, "The Samoan Submission Machine" Samoa Joe, "The Boss" Bobby Lashley and "The Blueprint" Matt Morgan. "TNA iMPACT!" 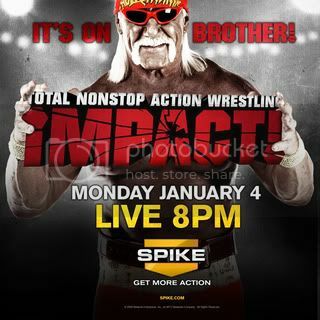 will resume to its normal timeslot on Thursday 7th January at 9/8c with an encore viewing of the LIVE "iMPACT!" special! 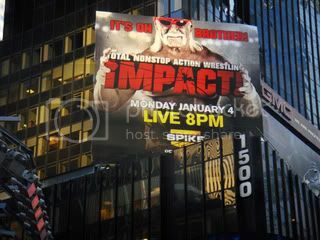 SpikeTV and TNA Wrestling have unveiled a huge billboard in New York City's Times Square to promote the upcoming Monday 4th January 3-hour LIVE Monday Night "iMPACT!" on SpikeTV. The billboard is located at 1500 Broadway in Times Square. If you are visiting New York City in the next few weeks, be sure to check it out. I cannot wait for this trainwreck. Cannot actually wait. I'm counting down the days to see how bad this show can be. It can't compete with last nights Raw however, no matter how bad it is. I genuinely hope the show is a success, but I hope you haven't set yourself up for a fall with that comment. TNA could easily find a way to do worse (and have done worse in the past anyway). All it'll take is Brutus & Knobbs coming in and taking the tag titles from British Invasion. People are talking about Knobs coming in like its a bad thing. Get him drunk and put him on air. Thats ratings! But seriously, I think TNA have done a relatively good job of buildings Hulk's debut and I've personally quite enjoyed Foley's reaction to the whole thing. I'd like to see some big names debut on the same show to make it more interesting, Flair and RVD would be nice, but I dont expect either. I'm looking forward to it purely as a Hogan fan, I hope TNA get a clue and dont turn it into a huge disaster. I'm hoping it's a good show, because well I want TNA to succeed and make WWE pick up their game consistently. It's hard watching wrestling right now because one week you could get a great match or great segment, and then the next you can get something atrocious. No consistency or momentum. So I'm really hoping it's a top show for TNA. Blind optimism maybe, but I'd take that over the big January 4th war (or as good as we're going to get now) to be a battle over which show was the sh*ttest and they're both sh*t. Won't look good for wrestling in general. And to be honest, that's the more intriguing part cause WWE will obviously win. It's just whether either of them produce a good/bad show cause at the moment neither of them can seemingly distinguish between good and bad. Impact has had episodes worse than last night's Raw before, and I don't doubt they will do it again. I just imagine a giant car crash of a TV show, which at least excites me to see how bad TNA can get. When they die, I wanna be there at ground level. So is the general opinion that Bret Hart will be involved with the Jan 4th RAW or was that nonsense last night just nonsense? If he is, Vince is a clever bloke, he knows how to pull an ace out of his sleeve when somebody challenges him in some way. I think it would also show that Vince feels at least slightly threatened which, of course, is ridiculous. It seems logical for Bret to appear soon, but this is WWE so it might just be grandstanding and come to nothing. Plus for Bret's return, wouldn't it be better using him as a special referee for a certain major match at WM? I remember reading that Hart was open to doing something a few months ago, then nothing, then they mentioned him last night and although it appeared to irk Vince, I cant imagine for 1 second that that wasnt all part of the script. I think bring in for something specific, like a grand match as I mentioned, and he'd be fine. Give him 3 weeks worth of promo/program with those two, hype the living crap out of it with great video packages, history etc. Not to mention with Bret you've got the Hart Dynasty he could help, could work with Austin in some way and obviously do something with Vince. Bret's never going to be a major draw, he's not a major star. But he'll certainly help them draw back some older fans and hopefully make for some exciting, role back the clock to 97, type shows. Which is why I hope he isn't a guest host, unless it's to do one of those things I mentioned. I forgot about the Hart Dynasty, but they seem below him. Yeah, looks like Bret will be Raw's host, Meltzer has all but confirmed it. He and Bret are pretty close friends. That's TNA's show dead in the water. Since TNA is watched mainly by older, long term fans, they aren't going to miss Bret Hart in a WWE ring with a live mic, over Hogan and Brian Knobbs. WOW! what a move by vince if its true, thought it would be the rock. It would be a massive waste to have Bret do the Jan 4th show, simply because without him, they are still going to comfortably beat TNA. So what's the point? I'd rather save him for WM, when they could potentially increase the buyrate with him. It could almost be a bit Goldberg/Hogan with him really. Could waste it all on getting a major rating when you don't actually need one. Yeah, that times a hundred. I mean they could do a show as crappy as Monday's...and still comfortably beat TNA. Surely that's more telling, than having to bring out a major star as a weapon to beat a company who struggle to beat ECW every week. It's like bringing in Rooney for a 3rd round match against Grimsby. Not really necessary. If Vince is saying that he's not worried, then by the fact he's using his mouth to speak, he's probably lying. He may not be worried about TNA beating him, but if he brings in Bret that night, he's doing it to kill off any possibility of anyone switching over. And if the Jan 4th show was like last Mondays, their would have been a lot of channel hopping. Bret Hart on Raw is to kill the TNA show, no other reason. If you think the TNA live show isn't on their radar, you are really gullable.